This report presents results on the general organic characteristics of sediment cores collected from the coastal zone of the Mississippi River system, including distributions of the important nutrient elements (C, N, P, and S). 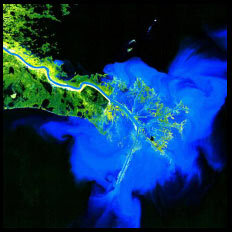 This was part of a larger study conducted from 2001-2005 to examine the delivery of sediment-associated contaminants to the Gulf of Mexico by the Mississippi River system, funded by the USGS Coastal and Marine Geology Program. Companion reports emphasize organic contaminants (Rosenbauer and others, 2006), and metals (Swarzenski and others, 2006). The level of contamination within the deltaic system of the Mississippi River system was determined through the collection of sediment cores from interdistributary bays, and offshore in the Gulf of Mexico, including the zone of hypoxia. Results provide the basis for reconstructing contaminant inventories from which to develop historic perspectives on nutrient loading and hypoxia, and to better understand how sediment-hosted contaminants either directly or indirectly move through biota and ultimately affect ecosystem health. Concentrations of C, N, P, and S in sediments varied by a factor of 10 between sites, and in down core profiles. Nearshore cores collected in 2001 proved to have erratic downcore C, N, P, and S profiles and sediment deposition rates, suggesting a high energy regime controlled more by variability in river flow rather than by geochemical processes and reactions within the system. These results focused further coring activities further offshore. Atomic C/N ratios suggest that organic matter deposited at all sites is a mix of microbial (algal) and terrestrial (vascular plant) remains, but with algal material dominant. Concentrations of total sulfur in sediments from cores in the zone of hypoxia were often higher than those in nearby zones with oxic water columns. Corresponding atomic C/S ratios were typically lower in sediments from sites in the zone of hypoxia compared to nearby sites with oxic water columns, and thus atomic C/S values may be useful as a proxy for identifying sites impacted by hypoxic conditions in the water column and for examining historical trends in hypoxia. At one site examined in this study, maximum hypoxic conditions were observed in the mid 1960's. The organic elemental composition (C, N, P, and S) of sediments was also used to guide sample selection for contaminant analysis, and to normalize the contaminant data to organic C content of the sediments. Dissolved hydrocarbon gases in sediments showed a dominance of methane, but identifiable concentrations of ethane and hexane, and trace concentrations of propane, butane, and pentane were also detected. All dissolved gases except hexane were dominated by "bound" gas, gas released only after agitation of the sediment in a blender. Hexane, in contrast was observed mostly as free gas, determined by headspace analysis.